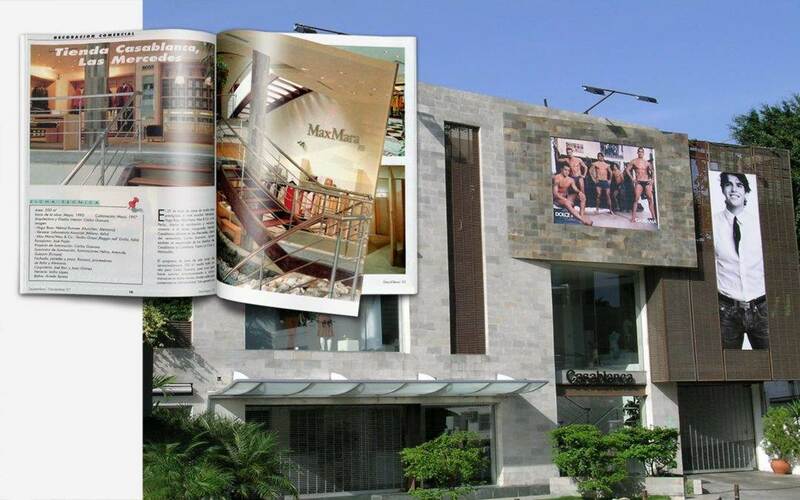 On May 29th the most prestigious world-wide fashion houses – Versace, Hugo Boss, Max Mara, Max & Co., and La Perla – gave their approval and recognition to the recently inaugurated Casablanca store located in Las Mercedes, project of the Venezuelan Carlos Guevara, who is also responsible for the designs of Casablanca La Castellana, Puerto La Cruz and Maracaibo. The area program of this store of approximately 500 square meters resulted a challenge for Carlos Guevara, since he had to make five brand names coexist harmoniously under the same roof, where each one would conserve its individuality. This generated a great space of diverse floors and levels, connected through stairs, with a common roof of 10 meters high and a zenithal light entrance that feeds life to the internal gardens. The autonomy required for each brand is going to be conferred by the unevenness, stairs and gardens, which work as divisor elements, in addition to not sacrificing the space opening. The rest is granted by the furniture that distinguishes each one of the brands at an international level, that in their majority are oriented towards designs where all the woods focused on white are the common element, except in the case of Versace. Versace has a rough and imposing image and it inclines more towards darker woods combined with stainless steel elements. The floors of the stores also define the environments, staying subtly underlined the step from one place to another. The section dedicated to cashiers and common access make use of the stone slate and of carob wood in the steps of the stairs. The Versace area, located in the upper floor, wears white Carrara and black marquina marble; for Hugo Boss it is black sapphire stone. In the case of Max Mara, the pavement I giallo antico marble, while the white granite is the seal of Max & Co. For Carlos Guevara, Casablanca Las Mercedes is a rich store due to its spatial quality more than for its materials, that even though noble, are kept in a second position in relation to the overwhelming space available. The most visible interior figures in the store are, in first place, the columns in stone finish and Spartan aspect, that probably represent the sole vertical elements outside the perimetral walls. After, we find the rest in oval shaped form; that is in the center of the main stair, tears that partially repeats in the plant curve skylight of 19 meters long, absolute responsible that the tropical sun and the Caracas Avila be invited to enter this European style temple.